The Historic Environment Service completed an English Heritage-funded project to enhance Norfolk’s early prehistoric records in December 2014. The county has a rich Palaeolithic and Mesolithic archaeological resource which has long been the subject of study. This project aimed to reassess all records for early prehistoric material in the Norfolk Historic Environment Record (NHER), and reexamine Palaeolithic and Mesolithic artefacts in the collections of the Norfolk Museums Service (NMS). Additional information was integrated into the NHER from the archives of prehistorians such as John Wymer and Roger Jacobi. Much of the material in the NMS early prehistoric collections was photographed for the first time, and key objects were selected for illustration. As a result of the work undertaken as part of this project there are now over 4,700 early prehistoric finds records in the NHER, of which 4,400 have a detailed description. 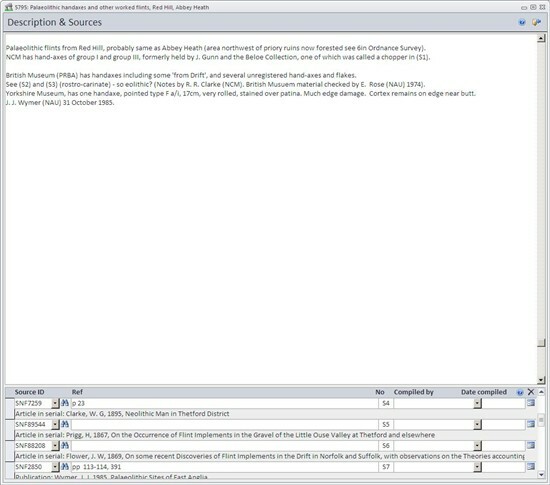 During the project 2,218 monument records were enhanced, with early prehistoric evidence being added to 333 records where none was recorded previously. 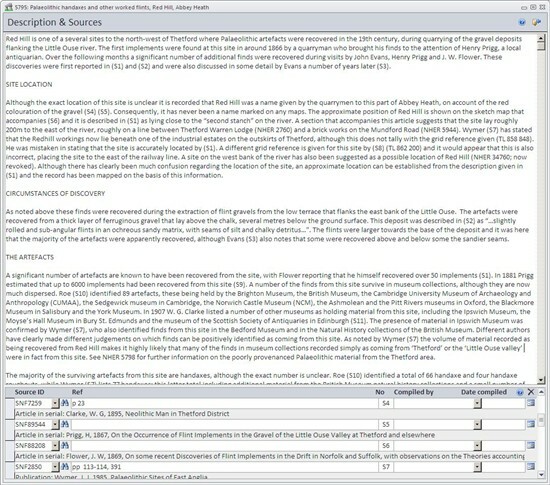 Additionally, 2,320 existing event records were modified, and a further 1,343 new event records were added; 6,166 new source references were added from 1,301 unique sources, of which 895 were entirely new. The enhanced monument and source records are available via this (Norfolk Heritage Explorer) website. Once the record enhancement was complete the records were systematically reviewed and assessed and the results were summarised in a report. This will be available online once it has been signed off by English Heritage. This resource assessment also informed the development of new planning guidance for dealing with early prehistoric archaeology in Norfolk. A programme of community outreach has also taken place as part of this project, with further talks and events planned for Spring 2015. 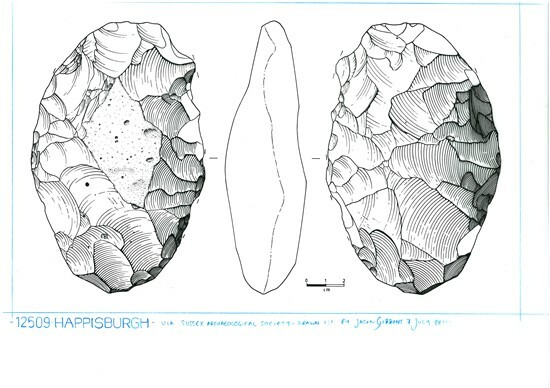 Illustration of one of the Happisburgh handaxes. Drawn by Jason Gibbons.